In the pot add 2 cups of water, 1 cup of sugar, the relax adaptogen powder and 1/3 cup packed mint leaves. Boil on medium until all the sugar is dissolved, about 5 minutes. Turn off and allow to cool completely. This time also helps the flavors meld and become mint simple syrup. Strain mint leaves out and set aside. Add both rums and lime juice to your pitcher. Add the blackberries and muddle using your potato masher. Then add your strained mint simple syrup, the extra cup of water and 2 cups of ice. Stir well. Right before serving add the can of plain or lime seltzer. 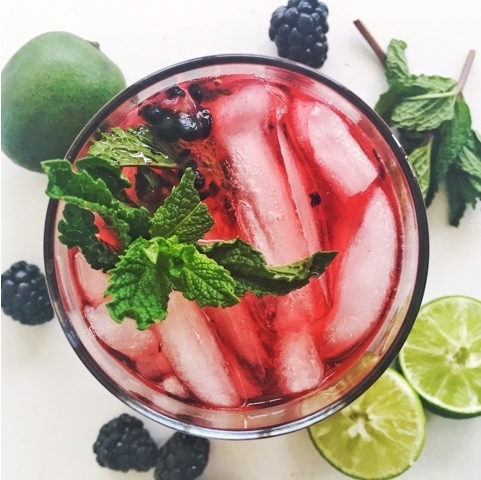 Serve with a sprig of mint and a couple blueberries and you've got a great Friday night cocktail. Perfect for warmer weather.